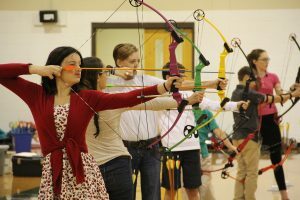 “Boing” of a basketball bounce on wood floors, “squeaks” of quick feet, “blare” of clock horns, pierce whistle pitch, the “clap” of hands; the “whip” of pom-poms, the “swish” of an arrow, the “pop” of its point on a paper eye; the “splash” of a dive, the “thud” of dismount, the “click” of a putt, “sigh” of defeat, “gasp” of surprise, the “YES” of success. Whatever the sounds of sports this winter, Lexington School athletes made their own noise. 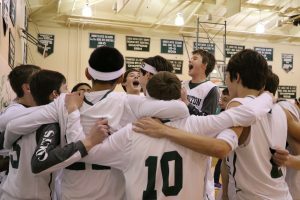 Here is your winter sports report. This winter season was especially fun and exciting for many reasons. 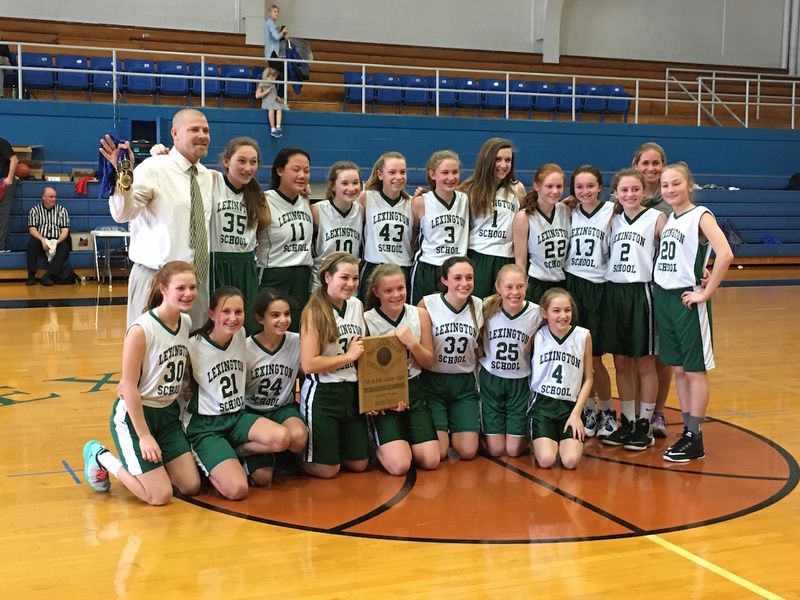 Some big wins over friendly rivals made for memorable community game nights, which led to the biggest news of all: Lexington School Girls 7th/8th grade team won the Parochial League Tournament beating Christ the King in a 21-19 barn burner. 2017 Parochial League Champions! 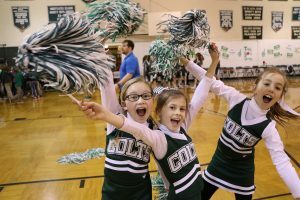 Cheerleading raises everyone’s spirit: Cheering for both boys and girls’ basketball teams this year was a spunky, new squad of roughly 15 girls 3rd-5th grades. Coach Anna Merritt says, “I couldn’t be prouder of how hard these young girls worked. They showed up to games and pep rallies with grit and determination to make a difference for all the teams playing and to raise everyone’s spirit.” With a young team of dedicated athletes, TLS cheerleading will prove solid for many years to come. 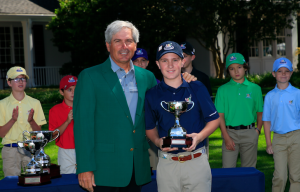 Finals of the Drive, Chip and Putt Championship where he finished 3rd in his age-group, 7th overall in driving and fifth in both putting and chipping.His 17 total points resulted in a three-way tie for third, six behind Liam Hartling of Redlands, Calif. The competition was broadcasted live on The Golf Channel and Hayden is a local celebrity, profiled by WKYT and Kyforward.com. SWIMMING and GYMNASTICS are highly competitive winters sports in Kentucky. This winter, 4 Lexington School athletes made their own noise. Let’s start with congratulating 6th graders Katherine Truitt and Zoe Schaeffer. This year Katherine and Zoe competed on the state level, and they swam straight to the top. 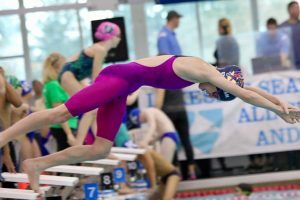 Katherine won the state championship in 50-yard Breast Stroke, placed 3rd in the 200 Medley Relay and 3rd in the 100 Breast Stroke. Zoe Schaeffer swam for 3rd place in the 200 Yard Medley Relay, 4th Place 50 Yard Back, and 4th Place 100 Yard Fly. Both girls broke records in several of their categories. Speaking of breaking records, how many 8th graders win 2nd in the city over all middle and high school divers? ONE: Reid Noonan. Congrats Reid, Katherine, and Zoe! Very impressive dedication and resilience to a tough winter sport. 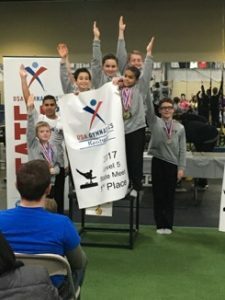 Next, Colin Hin ds (2nd grade) and Michael Crowe (6th grade) competed in the Kentucky State Men’s Gymnastics meet this winter. Both performed amazingly well. Michael received 2nd place in High Bar, 4th place in Vault, 6th place All-Around, and 1st place Level 5 Team. Meanwhile, Colin Hinds was State Champion in the Vault and the Pommel Horse for Level 5! He got 2nd place for all the other events and the All-Around. TLS athletes are something special because many are playing their sport for the first time while others train har d all year long. Watching them work and develop in the knowledge of sport and self is what makes the experience so rewarding for everyone involved. Through effort, failure, and ultimate growth towards improvement and success, one can hear the SOUND of confidence in their actual and metaphorical voice, and THAT sound is the best winter sport sound of all!